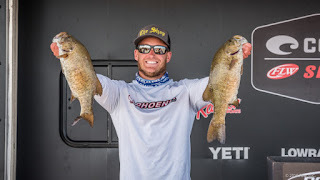 IBASSIN: 2018 Costa FLW Series Northern Lake Champlain Day 2: Brett Carnright Remains Leader with 40-15lbs! 2018 Costa FLW Series Northern Lake Champlain Day 2: Brett Carnright Remains Leader with 40-15lbs! Deep spawning smallmouth and local knowledge key for Brett.